Refurbished and beautifully appointed, the Cartwright House reopens as a true bed and breakfast. Built in 1903, this inn has a rich history dating back almost to when Oriental was founded. Located in a peaceful neighborhood in 'the old village', just steps from the waterfront & Lou Mac Park and 2 blocks from Town Dock. Free Gourmet Breakfast with Happy Hour! The Inn at Oriental is known for its friendly, comfortable accommodations. The ten guest rooms are tastefully decorated, r.and feature private baths and Cable TV. Experience Oriental Hospitality at its best! River Neuse Suites is the newest of Oriental hotels. Enjoy a weekend or a vacation in your room with a panoramic view of the Neuse River– sidebarlocated in our quaint fishing village. Our rooms feature bright, “beachy” decor with a modified kitchenette and big screen TVs. There are efficiency single rooms and upstairs/downstairs loft suites. We have efficiency suites that are pet friendly. Each room has free Wireless and Ethernet connectivity. We’re a 14-room boutique hotel in a quiet setting and with attentive staff. View on our website a list and layout of the rooms. The rooms look out toward the river and offer a bright, colorful decor. We offer various sleeping combinations that can accommodate most needs. You can make a convenient reservation online– or call for more info. Located in the heart of the "Village of Oriental". Whether you are planning a quiet romantic getaway, organizing a corporate retreat, vacationing with the family, looking for property, sailing, boating, motoring up or down the Intracoastal Waterway, traveling by car or cycling—STAY WITH US! River Dunes, a master- planned waterfront community, offers residents and guests the perfect launching point for unparalleled adventures on the water. Grace Harbor, a world-class 28 acre 400 slip inland basin marina with state - of-the-art floating dock system serves at the centerpiece of the Harbor Village that includes River Dunes Harbor Club with fine and casual dining, chandlery, swimming pool, spas, cabanas and Har Tru tennis courts. To accommodate guest boaters, The Landing offers luxury shower and laundry facilities and high speed fueling. Onshore accommodations are available in one of the one, two or three bedroom harbor side guest cottages that feature fireplaces, morning kitchens, and luxury spa baths. The Harbor Club is the centerpiece of River Dunes Harbor Village that includes Grace Harbor Provision Company, featuring grocery items, wine and beer, apparel, boat supplies and gift selections; a Wellness Center with fitness equipment and spa services; a retail shop with home furnishings, accessories and design services; and a café with baked goods, coffee and scratch-made items for indoor or outdoor dining. An outdoor amphitheater pavilion on the Harbor is a gathering place for community events and performing arts. A great deal of thought has gone into the architecture of the homes and amenities in the community, drawing from the rich heritage of the historic maritime village. Materials and color pallets are classic and authentic to traditional coastal building styles, yet state- of- the- art in comfort, convenience, and services. Waterfront and waterview homes and homesites for custom home construction are available. River Dunes welcomes overnight guest boaters with beautiful transient docks and guest memberships that include use of the Harbor Club facilities. The Harbor Club and Marina are also available for special events, including weddings, family gatherings, special brunches, luncheons or dinners, corporate retreats and yacht club rendezvous. The Stallings House is a beautiful, river front home in the heart of Oriental. The historic, three story house is able to comfortably accommodate about twenty people overnight. It has six bedrooms, five baths, and a large dormitory on the third floor. The two wrap around porches on the first and second floor, are a perfect place to unwind and enjoy the spectacular views of the Neuse. There is a large, fully stocked kitchen with two refrigerators, 2 stoves, a microwave and coffee pots. Outside, we have a spacious front lawn and a large pier in which you can dock your boat. The property is within easy walking distance to hotels, restaurants and shopping in the village. 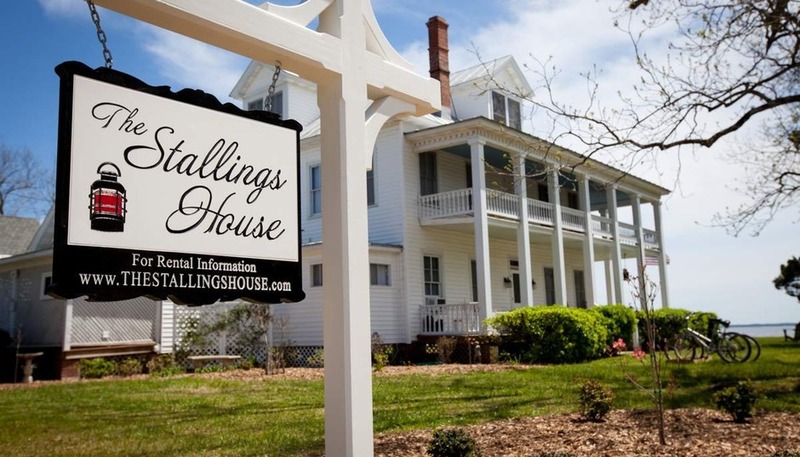 If you are interested in renting the Stallings House please contact us with the date you are considering. If we are able to accommodate the date, we will ask you to mail in a deposit to hold the dates. We would be happy to schedule an appointment for you to tour the property, when it is not rented. Please note that the house is closed during the winter months. RESERVATION: is not secured until a deposit is received. SMOKING: IS NOT ALLOWED IN THE HOUSE OR ON THE PORCHES AT ANY TIME. & bottom sheet, 1 pillowcase and 1 set of towels. If you rent them from us, then sets will be left in large tubs on the second floor for you upon arrival. AIR-CONDITIONING /HEAT: The house has a window air-conditioner in the downstairs master bedroom. The rest of the house is cooled by the wonderful breezes of the Neuse River. Ceiling fans are in all the rooms and box fans available for use when they are needed. The house stays very comfortable most of the summer months with the wide porches, large windows and tall ceilings. During the early spring or late fall, there are gas heaters for keeping the common rooms warm. We have plenty of blankets for the all of the beds The house is closed up during the winter months and is not rented. INTERNET ACCESS: A password for the Stallings wireless network is posted at the front desk. DOCK: Depending on the wind direction, the water depth at the end of the dock may vary from 3 to 8 feet on any given day. Diving is NOT allowed. Guests may swim at their own risk. The swim ladder on the dock should be left in the upright position when not being used, with the cotter pin inserted to keep it upright. Water shoes should be worn in the water to avoid potential cuts from sharp shells or barnacles near the shore. Swimming after dark is not recommended. around Oriental Village for short term (vacation) rentals. We look forward to making your visit to Oriental, an experience you will want to repeat again and again. Secluded private cabins 7 miles from town. Located within a 10 Minute Kayak Paddle from ONC Two 1400' Off Grid Cabins Available. Both Sleep up to 7 people. All Your Needs of Home Set in a Rustic Environment.